Zumba can be a very intimidating class to join if you have zero experience. How quickly will you learn the Zumba choreography, what should you wear, what should you bring to a Zumba class, how many calories can you burn doing Zumba? We want you to walk into your first Zumba class feeling confident and excited and ready to rock! The first thing to know about Zumba classes is that anyone can join in. Zumba is great at any age, with or without dance experience, and for any fitness level. Keep reading to find out how to successfully rock your next Zumba class! When you take your first class, show up 10 minutes early and meet the instructor and let them know you’re a beginner. Try to find a spot that will allow you to see the instructor clearly. A Zumba class is generally an hour long. 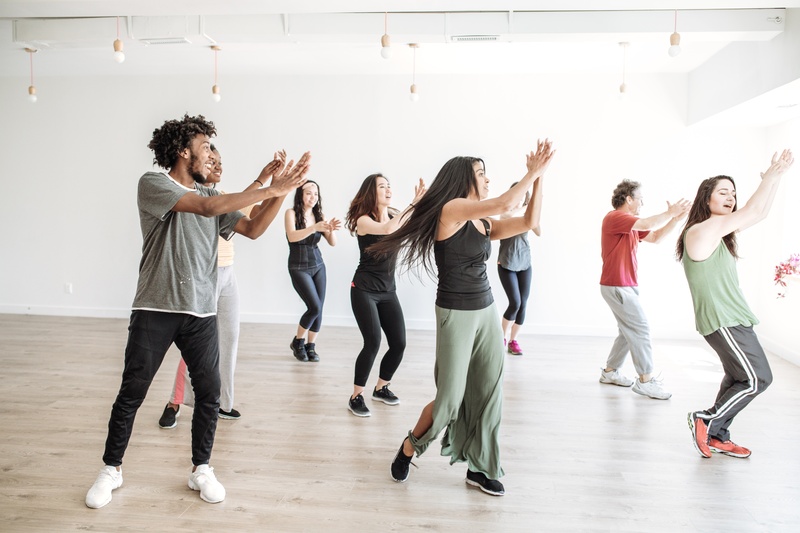 Zumba classes start with a warm up to prepare your body safely for exercise and the class will complete after a cool down period with some static stretching. Static stretching will consist of holding several stretches for anywhere from 15-30 seconds each. Ending the class this way will help you with soreness and a good recovery period after your workout. Your Zumba workout will consist of several songs and a different dance to each song. The dances are pre-choreographed by Zumba but your instructor may add to those. Some Zumba instructors will come up with their own routines. The most common Zumba dance moves or dance steps are called mambas, V-steps, exaggerated hips, cha-cha-chas, and side touches. Zumba classes repeat the same songs so you will get used to it after awhile. Expect for the class to be pretty warm, so dress accordingly. Read below on what to wear and what to bring to a Zumba class. Zumba is just like any other fitness class but with its own Latin twist on dance. Plan to move your body, even if you don’t know the Zumba choreography yet, keep moving. The quicker you feel comfortable just moving and being carefree, the quicker and easier you will pick up on the moves. There are actually only a few Zumba steps, so once you let go of the stress you have about figuring out every step perfectly, you’ll get the hang of it. Just move. It doesn’t matter if you go left when everyone goes right, if you are moving your body, having fun, and doing what feels right for you, then you’re doing great and still getting your cardio in. You can also find the Zumba steps online, if you want to see what it looks like or understand a couple moves before attending a class, then you can do that too. Some Zumba instructors may put their own twist on those official moves or even add moves but you can still benefit from peeking at the basics. Make sure you get a spot in the 2nd or 3rd row of your class so you can see the instructor but don’t worry, if you can’t see the instructor, just look at the person in front of you and follow them. It’s just like any other fitness class. If you go in with that mentality then you’ll do great. How you would approach Pilates, yoga, tybo, etc. should be how you approach Zumba. Go in, move around with everyone until you get all the moves down pat! Your Zumba attire does matter! You will absolutely want to wear loose clothing that is also very breathable. A fabric that supports a lot of sweating is a great option too. The classes can heat up quickly since the classes are very popular and the room tends to be full. If you come in a long sleeve, make sure you have something under it, so you can remove it later once it gets hot. You will also want to wear comfortable cross training shoes. You can also wear dance shoes. Running shoes aren’t ideal because they don’t provide enough lateral support that you will need. Bring water! You will need/want a lot of water. Between songs, you’ll usually get breaks for hydrating. Bring a towel to wipe away all the sweat from dancing your heart out! Some people like to bring a heart rate monitor to gage how hard they are working in the class. Good cross training shoes or dance shoes (not running shoes). An openness to letting your ego go and just dance! Click here to find out where you can attend a Zumba class for all of our different locations. Zumba is offered through Sport&Health Clubs in Ballston, Bethesda, Capitol Hill, Crystal Park, Lakeforest, McLean, Northwest, Old Town, Pike&Rose, Tysons and Worldgate.